Home. for the last year, this is the thing I have longed for most. On March 9th, 2016, devastating flood waters swept across our town and left many without their homes, businesses, and churches. I was eight months pregnant with our first baby when water began seeping into our home underneath the baseboards. within thirty minutes, there was a foot of water in our home. we stood there hopelessly as we watched the life we had built in our tiny white house nearly fall apart. I have never felt such despair. it was a moment I will never forget. We left our home that day with only what we could carry. from the street, I wept as I watched our house fill with water, covering all of our belongings + our most treasured possessions. that day, we said goodbye forever to our tiny white house. this was the home I found driving around one day, signed the lease the next day, and sat empty for five months until our wedding. this was the home my husband carried me across the threshold the night of our wedding. this was the home we learned so much about love and loss and marriage and forgiveness and life. this is the home we planned to bring our baby home to the very next month. but in a moment, everything changed. The weeks that followed were a blur, marked with tears, disbelief, fear, exhaustion. we moved in with my parents indefinitely. I was so grateful they took us in, but still heartbroken about the loss of our home. people told me how nice it would be to have all the help once the baby arrived, but truthfully, I wasn’t exactly thrilled about stepping into parenthood with an audience. I remember crying most of the month of March and a lot of the month of April. in addition to the flood uprooting us and the pregnancy hormones and preparing for a baby and all the changes that would take place upon the baby’s arrival, the job I had loved and held for five years was changing. for the first time in four summers, I wouldn’t spend my days with the children I nannied. and in the fall, Andy would begin kindergarten so they wouldn’t need me at all. it was just a lot at once. I know I was an absolute pleasure to be around during those weeks. "it's just stuff." I heard this more than once. and it's true, it is just stuff. it's only temporary. in the grand scheme of things, it doesn't matter. but let me tell you this: I love my stuff. probably a little too much. days after the flood, I was going through what had been salvaged and I came across a damp index card. 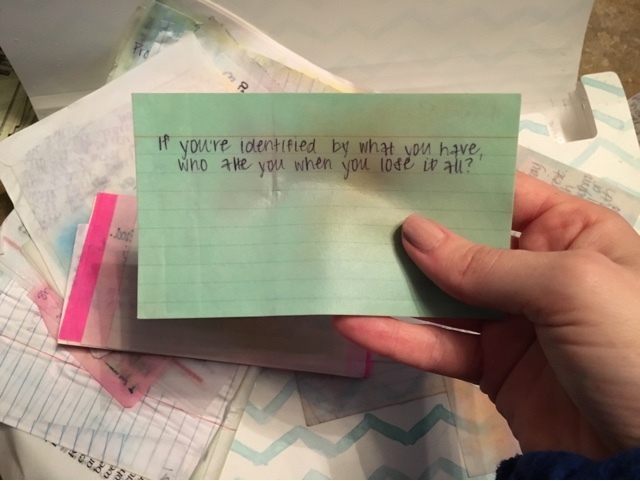 it read: "if you're identified by what you have, who are you when you lose it all?" my Sunday school teachers in middle school had asked that question and I held onto it all these years. I wept as I read it, never having understood the gravity of it and that I would be in a place where I'd have to ask myself this. Some mentioned that the flood was a "blessing," or would turn out to be. this was laughable to me in those first few days, even months. however, I was overwhelmed by how we were blessed through this trial. men in boats and trucks helped my family and others to salvage what we could. people helped with the flood relief. people gave to us. I saw with my own eyes the church being the church. I saw people we knew + loved and some who barely knew us before the flood love us in a way that only the Father can. and because of the flood, I was given one of the sweetest seasons in time with my family. I learned so much about home this year, and how it doesn't matter so much where you are, but who you're with. and people were right—all that help with the baby was nice. the next month, we welcomed our son into the world. the days following that were filled with joy, tears, and hope. in a time of darkness, the Lord so sweetly showed me how much He loves me, through His constant + timely provision and in the way He trades beauty for our ashes. every time I held our baby or saw him smile, I felt as if the Lord was saying to me, "I know a lot has happened, but here's this really great thing I made just for you." His goodness is overwhelming. life got a lot sweeter after the baby arrived. we adjusted to a new normal. we began saving as much as we could in hopes of buying a home. and then we waited. and waited. and waited. we waited for a credit score. we waited for a house. but not just any house. the right house. our house. we found a few we liked. I could have seen us living in any of them. they all had potential and would have been fun to fix up and call home, but the timing just wasn’t right. in October, seven months after the flood, we found it. I had driven past it hundreds of times and always thought it was beautiful. in fact, the afternoon we went to look at it with our incredible realtor, I passed by it earlier that day not knowing it was for sale and thought, “wow. now that’s my dream house.” I never imagined it would be mine. two months later, we signed the papers. and now it’s ours. I have seen firsthand how the Lord provides. I’ve seen this throughout my entire life, from childhood to adulthood. He was always faithful to provide great friends in all the places we lived growing up and He has been our joy + provision in the unknown. I know He will provide, though I struggle at times with unbelief. but one of my favorite parts of this story is not just what He provided, but how He provided. not just a house, but a home. a home that was better than I ever could have dreamed of. a home that was immeasurably more. we've spent the last three months renovating this home. it has been an adventure, to say the least. I'm sure my husband would say that's putting it nicely. it wasn't a major fixer upper, it just needed a little love... and some fresh paint, new flooring, bathroom updates, de-popcorned ceilings, a revamped staircase, and all new light fixtures + hardware throughout. but that's it really. it was certainly a challenge. that needs to be said. but it was fun, too. of course, fixing up a house has always been a dream of mine. so while it's not for everyone, this kind of thing is right up my alley. we are so grateful and humbled and I can't wait to share more about this adventure and our renovation story on the blog! "now to him who is able to do immeasurably more than all we ask or imagine, according to his power that is at work within us, to him be glory in the church and in Christ Jesus throughout all generations, forever and ever! amen." "and He determined the times set for them and the exact places where they should live. God did this so that men would seek him and perhaps reach out for him and find him, though He is not far from any one of us." "for every house is built by someone, but the builder of all things is God."